Conscious about your institution’s reputation? Protect your institution’s reputation and brand by demonstrating active involvement with surgical benchmarking. Get improved patient outcomes along with lower adverse events rates and costs savings! Poor treatment outcomes and a lack of reliable data to compare your institution with similar institutions can be one of the most insidious stressors hospital administrations have to deal with. SurgicalPerformance.com was founded on evidence that if clinical patient outcomes are measured, they will improve. Health care facilities can drive a culture of continuous improvement by registering as a SurgicalPerformance institution user to provide specific departments with a web-based database application for the Quality Control of health outcomes in surgery. For a full, up to date, list of procedures supported by SurgicalPerformance click here. SurgicalPerformance drives improvements on several levels. Relevant and accurate data are collected and fed back to the clinician in total confidence. It is widely believed that a focus on clinical outcomes will improve through the use of SurgicalPerformance. Reliable data on patients’ outcomes will enhance the conversation with both, clinicians and patients and will ultimately maximise the patient’s hospital experience. SurgicalPerformance also enables clinicians to benchmark complication rates against colleagues as a method of self-improvement, increasing knowledge and surgical performance. SurgicalPerformance reduces risk in case of a legal challenge. All participating O&G specialists earn 1 PAR point per every 12 cases entered into SurgicalPerformance through RANZCOG. Surgical outcomes are improved and complication rates are significantly reduced through accurate tracking and benchmarking against colleagues. O&G specialists have improved job satisfaction through increased knowledge, enhanced performance and through being proud of what they achieve. 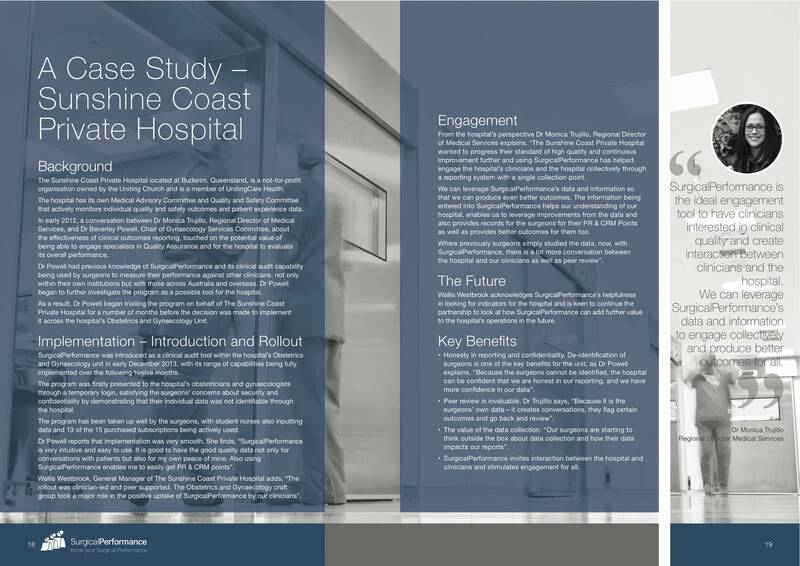 Increased cost savings due to fewer adverse outcomes, patient readmissions and return to theatre. Access to data on the number of procedures, associated patient factors and surgical details for all major gynaecological procedures, obstetrics outcomes, and colonoscopy procedures. Surgeon users are not identifiable through the institution user. Access to data on widely accepted standard KPIs of treatment (e.g. intraoperative visceral injury, readmission to hospital, unplanned return to operating theatre, etc.). Surgeon users are not identifiable through the institution user. Access to data on outcomes separated by location or department (e.g. public vs. private) and per time period as well as reports on KPIs such as conversion rates from laparoscopic to open hysterectomy, mesh erosion for pelvic floor repair, etc. Access to CUSUM data by tracking the cumulative incidence of adverse events over time to see if the outcomes are improving, worsening or steady. Kaplan Meier survival curves track and compare the probability of time-dependent variables, such as recurrence (endometriosis – pelvic pain, pelvic floor symptoms, etc.). Access to comparative reports on the incidence of outcomes in comparison with institutions, both nationally and internationally. … and more. View a full list of SurgicalPerformance’s extensive features. SurgicalPerformance fulfills all technical requirements of a modern web-based database and its security features are comparable with internet banking. Human Research Ethics Committee (HREC) approval and patient’s informed consent are not required (NHMRC National Statement on Research 2007). The number of O&G specialists from all parts of the world joining SurgicalPerformance and the number of cases that are now available for aggregate comparison by users is growing every month. In addition, health care institutions are already benefiting from being able to benchmark their outcomes as a surgical unit with national and worldwide data on patents’ outcomes. To enquire about a tailored proposal for your medical institution contact us.